One of the many adventures for engaged couples or newlyweds can be finding a place to live. They may need more money in the savings account before buying their dream home. In the meantime, they may decide to rent a tiny apartment that meets their basic needs. However, the couple can sometimes face the dilemma of not having enough space for all of their newly combined furniture from beds to couches. Many couples look no further than Vines Storage for a solution. We understand the dilemma of adequate space in your home for everything you love. We can provide an affordable solution as well as a few tips to ensure you can maximize your storage space at our Redlands facility. In addition to storing your furniture, we recommend keeping a fold-up stepladder in the unit for accessing boxes out of reach. When unloading the furniture, we recommend placing the largest items against the walls of the unit. Frequently used items should be placed near the entrance. We recommend creating an aisle for easy access to all of your items. We recommend storing large furniture vertically. If you are storing a sofa flat, a loveseat can be placed upside down on top of the sofa. You can often stack dryers on top of washers. Pillows, blankets, and sheets can be stored in washers and dryers. Fill any drawers with fragile items. Stack shelves of bookcases with books or small boxes. Wardrobes can store boxes containing fragile goods. Clothes can be stored in dresser drawers. 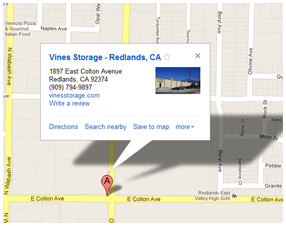 Rest assured all of your items are under watchful care at Vines Storage. We have a 32-camera surveillance system as well as alarms throughout the area. Our facility is a renovated warehouse, providing optimal conditions for all of your belongings. Whether the stay for your prized possessions is a few months or years, we can work with you to find the space that meets your needs. We also provide a safe and secure facility for RVs, boats, and classic cars. To learn more, call Vines Storage at 909-389-6209 today.